distribution Essentially in the mountains and Piedmont, and sparingly in the western third of the Coastal Plain; probably in the Sandhills region. abundance Fairly common in the mountains, rare to uncommon over most of the Piedmont, and very rare in the western Coastal Plain. However, abundance is somewhat difficult to assess, as the species often flies in late afternoon and near dusk, in shaded parts of forests. Also, it flies late in the season, when much odonate field work has subsided. Found in most counties within the range in the state. It is certainly not nearly as numerous or conspicuous as most darners of the spring and early summer seasons; however, it is one of the few darners that is more numerous in the mountains than it is downstate. flight Because this is a late summer/fall species, the mountain flight occurs somewhat earlier than the flights downstate. In the mountains it occurs mainly from early July to mid-November, peaking in September and October, with a few records even to late November. In the Piedmont the flight is later, mainly from late August to early November, and possibly into late November. However, there are early records in the mountains and Piedmont as early as mid-June. The few flight dates from the Coastal Plain are from late August to late September, though it certainly must fly into November there. habitat The vicinity of ponds, lake shores, marshes, and small streams, generally near wooded areas, but it can occur in open areas. Seldom seen near fields or areas far from water. behavior Rather secretive, often staying in shady places. Can fly over small open areas, darting back and forth, but usually only in late afternoon. 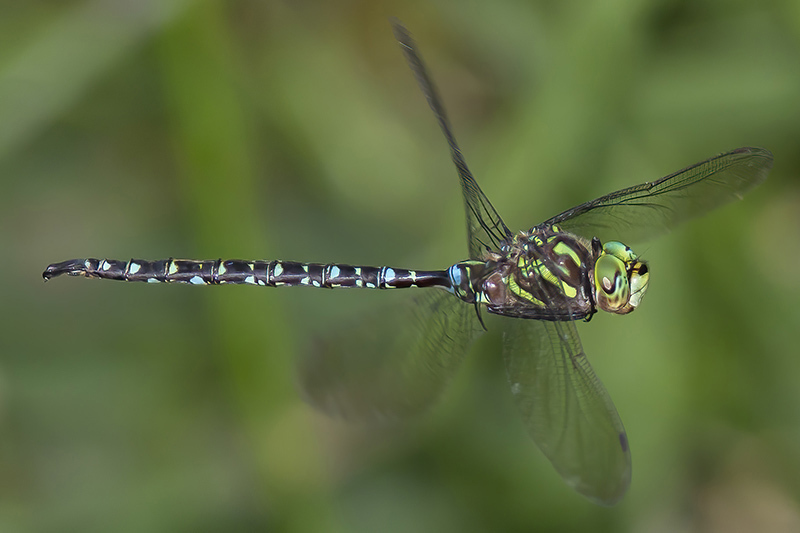 comments Of the "common" dragonflies in the state (collected/reported in over 60% of the counties), this is not a well known species to many observers, as it is rather scarce or hard to find in the Piedmont. Unlike other darners, it seldom flies around open areas, fields, or ponds during the morning or early afternoon hours; it keeps more to shaded areas and later times of the day for flying. Comment: Burke; M, 2017-09-19, In large farm pond at Jonas Ridge. - Heteromorph female. Comment: Alleghany, 2015-07-14, Stone Mountain State Park (STMO). Seep and boggy area near campground Loop B. - Male. Patrolling and hovering in shaded boggy area. Low light flight photo taken.